You are here: HomenextTransportnextTransport - shipsnextMARBURG in the locks. The coaster MARBURG in Tilbury locks . More info please RWJ. The containership MARBURG (2899 tons gross, 3916 deadweight) was built at Boizenburg, Germany, in 1995. The ship was owned by Jorg Kopping of Hamburg and under an agreement peculiar to several German shipowners, flew the flag of Antigua & Barbuda, but retained home port of Hamburg (Germany had, over the years, similar arrangements with Cyprus and Singapore). 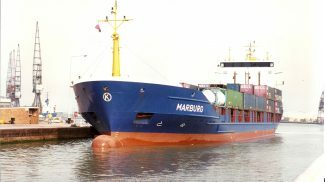 In 1997, the vessel, which has a container capacity of 344 TEU, went on charter to Geest North Sea Line and was renamed GEEST MERCHANT. Ten years later, in 2007, another change took place, and this time it was sold by Kopping to Caribe Merchant Shipping Antigua Ltd, and was re-registered at St John’s Antigua, and given the new name of CARIBE MARINER. To impress, as of yesterday it was on voyage from Belize to Fort Lauderdale.